From left to right: Roy Bennett, Quincy's Directory of Materials; James Mellor, General Dynamics Executive Vice President, Marine Operations; Ms. Kelley; General Kelley; Everett Pyatt, Assistant Secretary of the Navy (Shipbuilding and Logistics); Ms. Thelma Watts, Quincy Welding Instructor; David S. Lewis, General Dynamics Chairman and Chief Executive Officer; and Gary S. Grimes, Vice President and General Manager. The construction of five Maritime Prepositioning Ships for the U.S. Navy commenced in 1983 at General Dynamics' Quincy Shipbuilding Division in Quincy, Massachusetts. 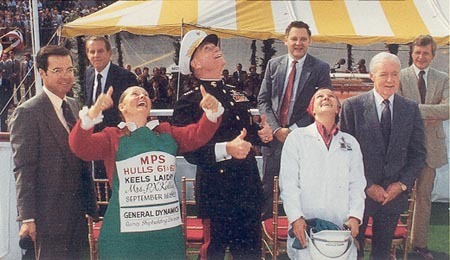 Ms. Barbara Kelley, wife of General P. X. Kelley, Commandant of the Marine Corps, had the honor of welding her initials on both keels of MPS 61 and 62 at the Keel Laying Ceremony on September 16, 1983 . MPS 61 was later christened the 2ND LT JOHN P BOBO, and delivered to the Navy on February 14, 1985. MPS 62 was christened the PFC DEWAYNE T WILLIAMS, and delivered to the Navy on June 6, 1985. © 1999-2006 Utility Press Inc. All rights reserved. Copyright claim exclusive of photograph.